The Sun’s corona constantly breathes wispy strings of hot, charged particles into space — a phenomenon we call the solar wind. Every now and then, however, those breaths become full-blown burps. While astronomers have known about the blobs for nearly two decades, the origin and impact of these regular solar weather events remain largely mysterious. Until recently, the only observations of the blobs have come from Earth-bound satellites, which can detect when a train of blobs bears down on Earth’s magnetic field; however, these satellites can’t account for the myriad ways the blobs have changed during their 4-day, 93-million-mile (150 million kilometers) journey from the Sun. Now, for the first time, Viall and her colleagues have observed the blobs as they appear in their own neighborhood. In their new study, the astronomers found evidence of the blobs in 40-year-old data. Those observations confirmed that the blobs are incredibly hot when they leave the Sun — sometimes twice as hot as the average solar wind around them — and might bubble out of the corona every 90 minutes or less. Since the solar blobs were first studied in the early 2000s, scientists have known that they are big — initially measuring between 50 and 500 times the size of Earth, and growing ever larger as they propagate into space, Viall said — and they are dense, potentially packed with twice as many charged particles as ordinary solar wind. Magnetic field readings show that when these gargantuan blobs of plasma ooze over Earth, they can actually compress the planet’s magnetic field and interfere with communication signals for minutes or hours at a time. Still, those readings leave a lot of open questions, Viall said, because the blobs almost certainly evolve and cool as they wobble through space for the 4 days it takes solar wind to reach Earth. So, Viall and her colleagues decided to study the blobs much closer to their source. In the new study, the researchers took a fresh look at historical data from Helios 1 and Helios 2, a pair of solar probes launched by NASA and the German Aerospace Center in 1974 and 1976, respectively. The twin probes orbited the Sun for nearly a decade, making a closest approach of 27 million miles, or 43 million km (closer than the orbit of Mercury) while studying the temperature and magnetism of the solar wind that gushed past. If either of the probes had been engulfed by a train of gargantuan lava-lamp blobs, the encounter should be reflected in these readings, Viall said. The researchers looked for one data pattern in particular — sudden bursts of hot, dense plasma punctuated by periods of cooler, flimsier wind — and found five instances that fit the bill. The data from these events showed that the blobs bubbled out of the Sun every 90 minutes or so, supporting visible light observations of the blobs made decades later. The results also provided the first real, space-based evidence that the blobs are indeed much hotter and denser than normal solar wind, Viall said. As to why the blobs form in the first place, the jury is still out. 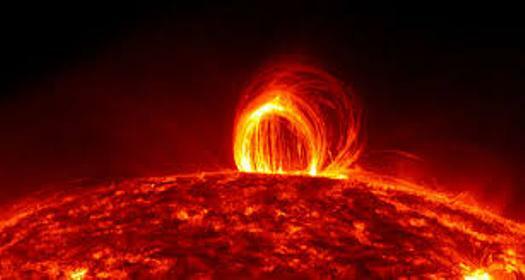 But, based on magnetic field readings taken near Earth, it’s likely that the blobs form in the same sort of explosions that create solar storms — massive blasts of plasma that launch forth when the Sun’s magnetic field lines tangle, break and recombine. “We think a similar process is creating the blobs on a much smaller scale — ambient little bursts as opposed to giant explosions,” Viall said. Results from NASA’s Parker Solar Probe, which launched in August 2018 and is now about 15 million miles from the Sun (24 million km), could soon confirm these suspicions. In addition to the 40-odd years of technological advancement that Parker has over the Helios probes, the Parker mission also ranges far closer to the Sun — coming within just 4 million miles (6.4 million km) of our local star at its closest approach. From this sizzling vantage point, the probe should be able to observe the blobs “right after they’re born,” Viall said.